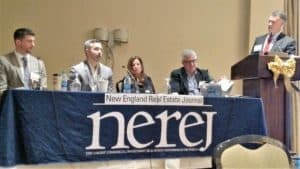 Bob Allaire of Licata Risk moderated a panel of real estate executives at the program The Changing World of Commercial Real Estate on December 13 at the Sheraton Needham Hotel in Needham, MA. Panelists included John Sokul of law firm Hinckley Allen, Corey Gustafson of Colliers International, Evan Eisenhardt of Linear Retail and Carol Todreas of Todreas Hanley Associates. The program was a production of The New England Real Estate Journal.